The lasting images of the 2017 Cubs bullpen are not favorable ones. In the NLCS alone, we saw Carl Edwards, Jr. walking Yu Darvish on four pitches with the bases loaded, Hector Rondon getting passed over in the ninth inning of Game 2 in favor of John Lackey (a career starter who had never pitched on back-to-back days) and prized midseason acquisition Justin Wilson getting left off the roster entirely. The moments were emblematic of the bullpen’s struggles throughout the entire postseason. As a group, the bullpen combined to produce a 6.21 postseason ERA, with a staggering 27 walks in 37.2 innings pitched. General Manager Jed Hoyer referred to his bullpen’s inability to throw strikes as “a disease.” It was certainly uncharacteristic of a group that was among the best in the National League over the course of the regular season, but it was troubling nonetheless. Partly because of the success of the position players and the rotation, the bullpen has been overlooked. But another major factor is how the front office has chosen to construct the bullpen over the past few seasons. Rather than investing big dollars into the bullpen by giving out lengthy contracts, the front office has taken the opposite approach: short term commitments and lots of fluidity between roles. Assuming Brandon Morrow takes most of the ninth inning chances in 2018, he will become the Cubs’ fourth different primary closer in the last four years. The Cubs’ approach is an interesting contrast to a growing trend around baseball, which emphasizes fewer innings from starters, more aggressive bullpen usage and, thus, places a premium on elite bullpen talent. This was largely spurred by the success of the Cleveland Indians in the 2016 postseason, who were very aggressive in lifting their starters early, instead choosing to rely heavily on Andrew Miller, Cody Allen and Bryan Shaw to work multiple innings in relief. In response, a number of teams have adopted the strategy, and have been attempting to build so-called “super-bullpens” Among these teams, the Yankees, who feature Aroldis Chapman, Dellin Bettances, David Robertson and Tommy Kahnle, are most notable, but even the pitching-challenged Rockies seem to be trying it: Colorado spent over $100 million on relievers this offseason, signing Shaw, Jake McGee, and former Cub Wade Davis. The 2018 Cubs bullpen is not a “super-bullpen,” nor is it designed to be. The Cubs still need to (and want to) get length from their starting pitchers each time out. The rotation may be best in the best in the game, and the Cubs want to maximize that advantage. Even so, there is a lot like about the 2018 bullpen, and below I have expanded on some reasons for optimism and why I think this particular bullpen is well suited to this team and manager Joe Maddon. However, no bullpen is without its questions marks, and I follow up with a list of places where it could all fall apart for this year’s bullpen. Even though he has made it known that he prefers to start, Mike Montgomery’s ability to work as either a multiple-inning reliever or a matchup lefty (or both) is a huge weapon for the bullpen, not only because of his effectiveness, but also for how can set up the rest of the ‘pen. Working primarily as a long man, Montgomery excelled last year, posting an ERA of 1.95 in outings in which he came into the game as a reliever and pitched for more than one inning. And even though his platoon splits are pretty mild (over his career, he’s been about even against righties and lefties), Maddon can also choose to deploy him as a situational guy against tough lefties, and then ride him for another inning or two to get to the back end of the bullpen. For instance, imagine a scenario in which the Cubs are clinging to a tight lead with runners on base and two outs in the fifth inning, and Tyler Chatwood is due to face the Cardinals’ Matt Carpenter for a third time. Rather than running the risk of having Chatwood face Carpenter for a third time, or burning Justin Wilson or Brian Duensing to get a single out early in the game, Maddon can go to Montgomery for the situational out, and then leave him in to work the next inning or two, thereby preserving the rest of the bullpen for matchups later in the game. For large portions of last year, it seemed like Carl Edwards, Jr. was taking a step forward to be counted among the elite relievers in baseball. Much has been made of about Edwards’ unique fastball, which has the highest spin-rate in baseball among four-seamers, and which also comes with above-average horizontal movement. So much horizontal movement, in fact, that his four-seamer could rightfully be labeled as a cutter. High-spin fastballs tend to generate swings and misses, and horizontal movement leads to grounders and weak contact by moving the ball just off the barrel of the bat. Sure enough, Edwards generated whiffs on 31.0 percent of his fastballs, while also running a league-average 44% ground ball rate, and an above-average 24% soft contact rate . Not surprisingly, his BABIP against in 2017 was a miniscule .195, after posting a .162 BABIP in 2016. As long as he is pounding the zone with strikes, Edwards is as unhittable as any pitcher in the game. The Cubs took a flier on Duensing last spring, signing him to a short-term deal without much fanfare. As a journeyman lefty specialist, Duensing wasn’t expected to provide much more than some carefully selected at-bats against lefties in the middle innings. However, by the end of the year, he had turned into one of the more reliable bullpen arms against batters from both sides of the plate, especially during the bullpen’s October meltdown (Notably, Joe Maddon had Duensing pitch the 8th inning and the first two outs of the 9th of a tie game in Game 2 of the NLCS). Fangraphs’ Jeff Sullivan recently discussed Duensing’s change in his approach to righties, choosing to go after them with his curveball early in the count and at a much higher rate in 2017 than he had previously in his career. This allowed Duensing to achieve a level of effectiveness against righties he never experienced before. Almost certainly, this change in approach came at the suggestion of the Cubs pitching and run prevention staff, and that relationship may have been why Duensing turned down other, more lucrative contracts this offseason to return to the Cubs. As we’ve seen year after year with the position players, the Cubs, and Joe Maddon in particular, place a great deal of emphasis on flexibility. Whereas many other teams may have looked to trade away some of the seemingly redundant pieces the Cubs have on offense, the Cubs view this redundancy as a strength. With so many players that can play every day, at multiple positions, the team has the depth to weather injuries or ineffectiveness, while relying on Joe Maddon’s management skills to keep everyone satisfied with their playing time. Not surprisingly, the bullpen appears to be constructed in a similar manner. None of the main bullpen arms have glaring platoon splits, which would relegate them to only a specialist role. Perhaps most notably, the Cubs lack a Proven Closer and, as a result, are less likely to adhere to rigidly defined roles over the course of the season. This plays right into Joe Maddon’s hands, as he has a tendency to ride the hot hand when it comes to his bullpen. The Cubs depth and flexibility in the bullpen this season allows him to do just that. Brandon Morrow threw 25 pitches last night? Have CJ take the ninth and keep Morrow fresh. Justin Wilson never gets it back together? Give Duensing his innings, or move Montgomery into more of a situational role. Strop needs to take it slow coming out of spring training? Let Cishek take his spot. Realistically, the Cubs have five guys with more than enough ability to be a Proven Closer, if given the opportunity (Morrow, Cishek, Edwards, Strop and Wilson), none whom were in that role at the end of last year. However, as Sam Fels mentioned last week, these things have a way of sorting themselves out. I imagine Joe will let the same thing happen again in 2018. The one thing holding Brandon Morrow throughout his entire career has been his ability to stay on the mound. Prior to 2017, Morrow’s last full season was in 2011, and he endured surgery in late 2015 to fix a shoulder impingement. In addition, Morrow was used heavily by Dodgers manager Dave Roberts in last year’s postseason, logging 13.2 additional innings and pushing his combined total for the year to 77.1 – his highest total since 2012. Of course, Joe Maddon and the Cubs’ front office are well aware of Morrow’s injury history, and they will look to limit his workload, particularly early in the season. The expectation is that Morrow will not pitch more than two days in a row, and the Cubs may make him unavailable the day after particularly exhausting outings, all with the goal of keeping him fresh and ready for October. However, the best predictor of future injuries is previous injuries, and so Morrow’s health questions will follow him for the rest of his career. Carl Edwards Jr.’s stuff is undeniable. However, on occasion, he will find himself in a position where he has lost the strike zone entirely with all of his pitches. Ken Schultz wrote a piece here at BP Wrigleyville on this last August, in which he counted five such outings in 2017 up until that point (by my count, Edwards had one more in the regular season, and two in the postseason). In those eight outings, Edwards managed to walk a staggering 17 batters while recording only five outs. What is especially maddening with these bouts is that they come from seemingly nowhere. For instance, in the month of July last year, Edwards made 11 appearances in which he allowed no earned runs and struck out 19 batters over 11.1 innings. However, mixed into the middle of that stretch was one appearance against St. Louis in which he came in to protect a 3-2 lead, and promptly allowed a leadoff double, and then walked the next two hitters, forcing Joe Maddon to remove him before recording an out. Similarly, his first appearance in August featured walks to the only two hitters he faced. To his credit, Edwards recognizes these difficulties, and mentioned last year that he was trying to learn from the always-calm Wade Davis. Hopefully, Edwards can keep these outings at bay in 2018, as they could be the only thing standing between him and greatness. Counting on relievers for anything is a risky proposition. Reliever performance is inherently volatile, subject to the whims of small sample sizes. Further, counting on a 35-year-old reliever without overpowering stuff to repeat the career year he just had at age 34, based largely on a change in approach and pitch selection, may be a fool’s errand. While Duensing’s newfound approach may be sustainable, the league has now had a year to scout it and make the appropriate adjustments. That could leave Duensing vulnerable if he is not similarly adaptive, because he doesn’t have the stuff to blow away good hitters. When the Cubs traded for Justin Wilson last July, they were expecting to get a shutdown, late-inning reliever who could help solidify the bullpen and act as a left-handed compliment to closer Wade Davis. Prior to coming to Chicago, Wilson served as the Tigers’ primary closer in the first half of 2017, posting a 2.68 ERA with a strikeout rate of 35.0%, against a walk rate of 10.2%. And while that walk rate is somewhat elevated, the hope was that Wilson’s elite strikeout rate would more than offset the free passes. However, Wilson never found his footing with the Cubs. After walking two hitters, uncorking a wild pitch and allowing an earned run in his first appearance, Wilson continued to struggle for the rest of the season. Command was the primary issue, with Wilson walking 22 batters in 23.2 innings. However, he was also hit hard – his soft contact rate allowed dropped 6 percentage points after moving to Chicago, and he allowed an astronomical .391 BABIP. The struggles were baffling, given that Wilson’s outstanding four-seam fastball, which he relies upon heavily, didn’t see a significant drop in velocity or movement. 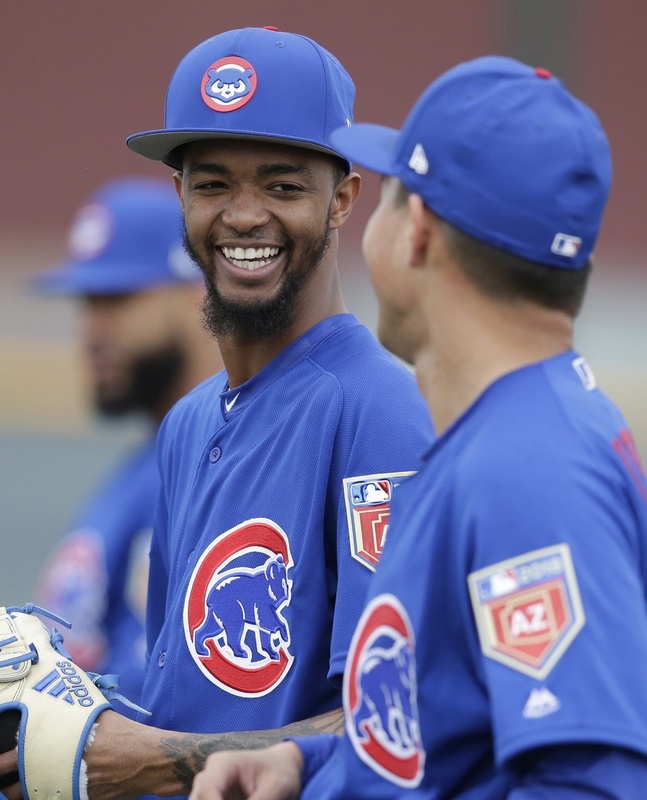 Instead, his late-season struggles were chalked up to difficulties with the mid-season move, and the idea that Wilson began to press after starting his Cubs career on a rocky note, ultimately undermining his confidence. The hope here is that the offseason allowed Wilson a chance to clear his head and settle in in Chicago. However, given the lack of physical signs associated with Wilson’s decline last summer, until we see him performing back at a high level, it’s hard to know what the Cubs have in him.